The Project4Maps© Mindjet MindManager Template pack includes 71 maps and Microsoft Excel spreadsheets developed specifically for project management, a specially designed project management icon set, a predefined Project Index Marker set and a detailed "How To" E-Book, Projects4Maps™ that provides an entire framework for project operations. Whether you are starting out in project management or a seasoned Project Management Professional our Projects4Maps™ templates pack provides a visual and transparent way for managing project planning, Implementation and closure. SAVE TIME: This template pack is not an "examples pack" but has been carefully researched,crafted and developed to provide a comprehensive project management template set that can be immediately used at any stage of a project. This gives you the power to make every project map customizable without loosing original vesion. Project4Maps - the power to develop better projects! We provide consultancy and training and work with your team in teaching how to use visual mapping as way of simplifying complex projects without forcing a rigid method or regime. 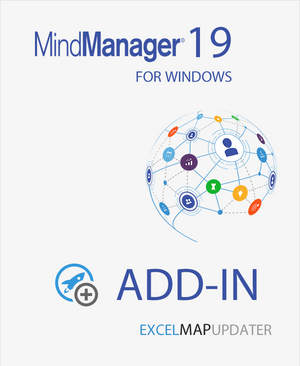 MindManager projects integrate with the full Microsoft Office and Project Suite and save time by going fro project directly to report. This alone will save hours or time.